Event purpose: To conduct a formal ceremony for the replacement of current worn U.S Flag and provide education of proper Flag Etiquette to the student and staff. Additional Photos can be found at the link below. Background information was presented about the use of bugle calls used in the ceremony. 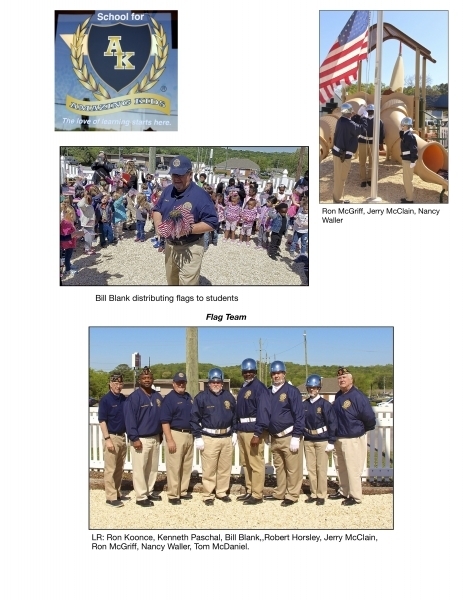 The event was used as a way to educate the children about the importance of the U.S. flag. This is the second time Post 55 has replaced a flag at the school. The Ceremony consisted of the lowering of the worn U.S Flag after the sounding of “Retreat” and lowered to the sounding of “To the Colors” bugle calls. The flag was folded in the appropriate manner. The new flag was raised to the sound of “Reveille” bugle call followed by the National Anthem. Miniature US Flags were distributed to all children and event attendees. The pledge of Allegiance to the Flag was led by Stephine Monday, Auxiliary Unit 555 President. TheSchool and staff were recognized for their patriotism in the displaying the U.S Flag at their place of business. The ceremony was concluded to the playing of the Stars and Stripes March.